Leading Manufacturer of current transformer from Ghaziabad. With the assistance of our team of professionals, we are engaged in providing an assorted range of Current Transformer. This transformer is an electric device that produces an alternating current (AC) in its secondary which is proportional to the AC in its primary. 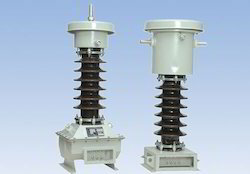 Under the direction of deft professionals, our offered transformer is manufactured using quality tested components with the aid of sophisticated technology as per the defined industry standards.